I am late in posting today, but honest I have a very good excuse! For some reason my wifi is so slow, chalk it up to the heavy winds today! I don't know about you, but I have a difficult time in choosing the perfect gift for the "Him" in my life, sometimes he is the one who has everything and then there is the him who could use just about everything! Quite the conundrum! With only 77 days remaining and not a clear idea as to what to get for the special man or men in our lives! I found this absolutely wonderful shop called SivaniDesignsShop and the things she has for men are really very, very nice! 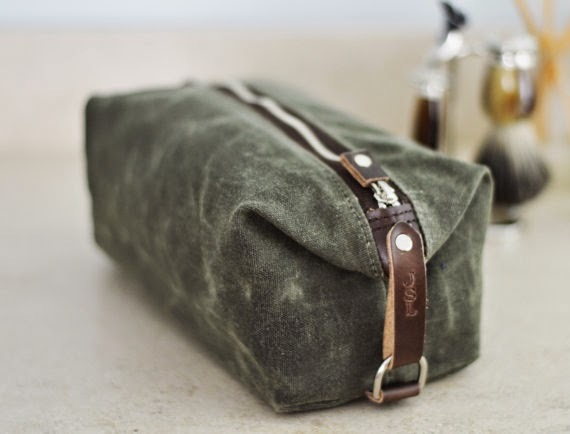 There are so many toiletry kits tat Sivani makes but this one is my favorite, it's waxed cotton canvas and leather and its color is military green (I am a sucker for military men) and this has taken my fancy. Silvia can also make you a custom order with embroidered message inside, so if you have a special message you'd like your man to see every day, just tell her and she can do that for you! 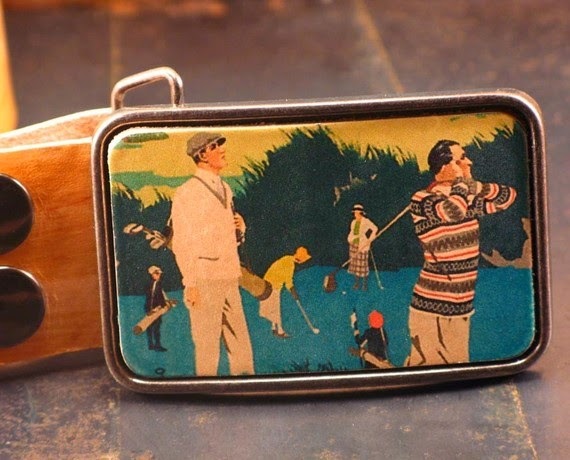 I found the nicest belt buckles and for the man who golfs, this might make an excellent nostalgic gift to give him this Christmas! I very unique belt buckle designed and made by Naomi from her shop flightpathdesigns of course there is quite a variety of designs from which to choose, but I happened to fall for this specific buckle! I love this nostalgic look back at the game of golf, who wouldn't? How about the guy who loves to cycle? 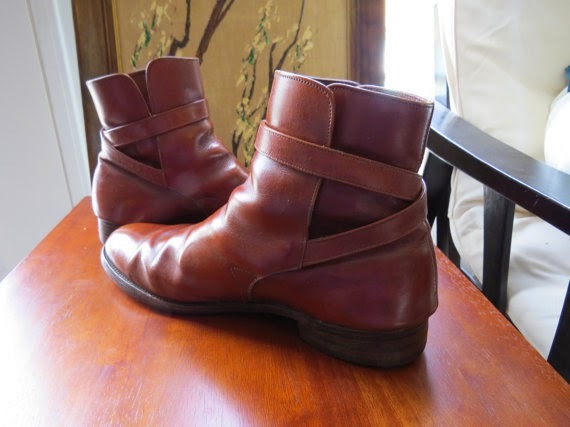 I found these vintage Brown Leather Mens Strapped Ankle Motorcycle Boots at fromanotherday whoa, these would be a neat gift for the man who loves wearing leather boots and does not enjoy those heavy clunky standard biker boot! 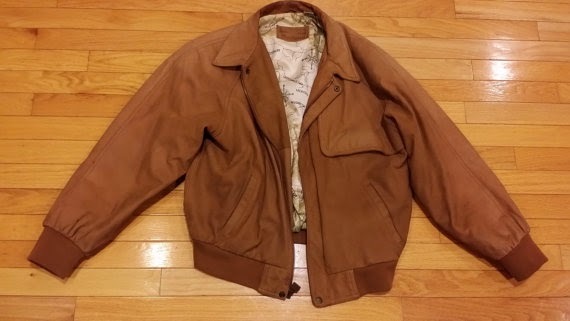 And how about a matching Retro Maloboro Leather Bomber jacket to go with those boots? I found this one I just love the look of at UltraRetroNET, isn't it terrific? Of course, he also needs a pair of riding leather pants to complete this outfit and I found just the pair over at kathysfuncreations! 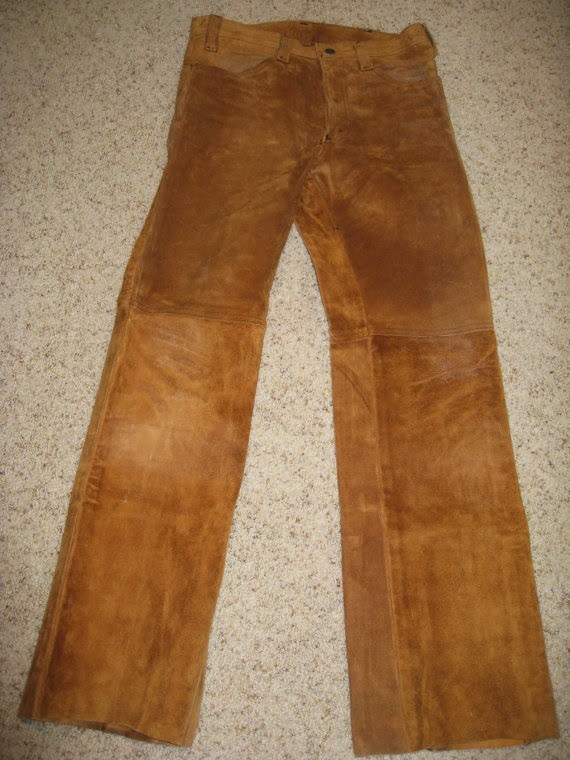 Their a shade light than the jacket but a super combination because these are actually vintage leather Suede Levi's! How great are these? you'll have to visit VelvetWillows shop to see the rest of this longgggggg title! It would certainly give him something to chuckle about before he retires for the night! So, you don't have a man that likes riding motorcycles, or one that plays golf, but he does like to dress up and take you out to dinner and then dancing, so maybe if you have one of those men he might enjoy something from OffTheCuff2010! Pete Lever makes something slightly different for discerning men who want to stand apart from the norm. In this shop you'll find some watch movement items in the form of cuff links, rings, tie clips and such, very unusual and has that steam punk look! 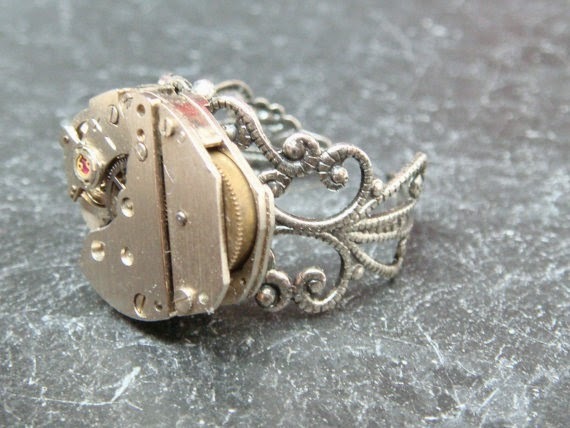 Here is a ring I found and it is very unusual as well as very interesting! 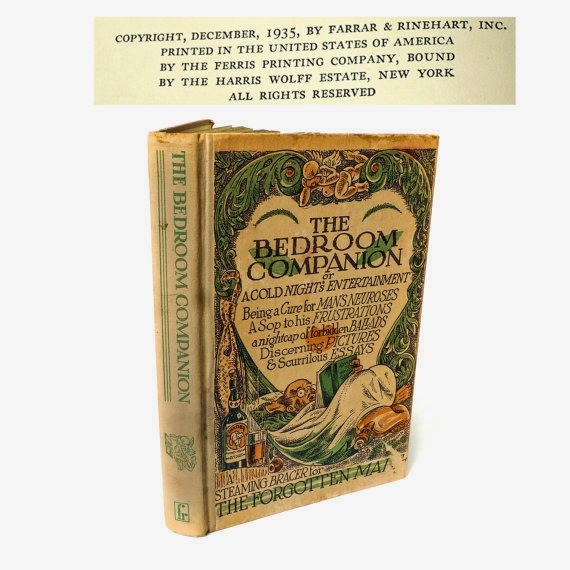 There are hundreds of shops at Etsy where browsing you'll find just that perfect gift for the perfect man in your life, all you have to do is search for what you have in mind and you most certainly will find it here at Etsy!